First let me say that the repair shop probably isn’t responsible for some of the stuff I’ll be showing off, but if your advertisement makes it seem like the board I’d receive would be a very reliable, good working board, this certainly isn’t anywhere near the truth. 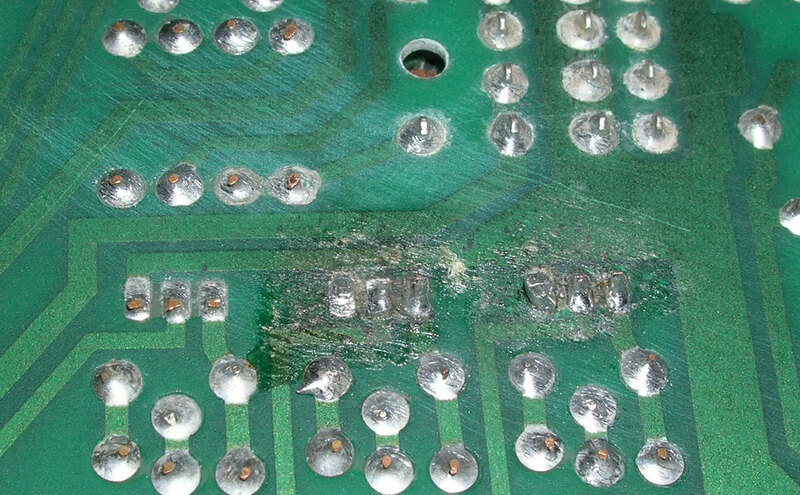 Problem #1: Even though this is was touted as an upgraded board where the usual burned up resistors were replaced w/ flame-proof equivalents, they didn’t replace any of the connectors! These connectors are the first things that should be replaced, especially when the pins have burn marks on a few of them. The white headers also have round pins, but the mates to the headers mate via a flat surface, which makes for a very small contact area (think of a square touching a circle). Any kind of corrosion makes the contact resistance go up, and thus begins the process for burned up connectors and intermittent problems. The new connectors/headers have square pins, and the crimps in the receptacles utilize the Molex Trifurcon crimps, which means instead of a single wiping/contact surface, there are three to ensure a good low-resistance connection. Problem #2: Sure the burned up resistors were replaced, but they never bothered to clean up the flux! This makes for an amateur-looking repair, and if the flux is still slightly acidic (like rosin flux), the acid will start eating away the solder joint over a long period of time. It also turns out that after I cleaned all the flux off, whoever did the repair gouged the board all up around the resistor holes with their soldering iron (not visible as the flux hides all that stuff). Classy. Problem #3: On the subject of messy flux, at some point someone tried to clean up their flux mess on some other areas of the board with what looks to be a wire brush. Luckily this didn’t really damage the board much, but it looks absolutely awful. It cleaned up easily though. Problem #5: Oddly this wasn’t as prevalent as I thought it would be, but there were some cold solder joints from someone touching things up on sketchy 40-pin connector (also not replaced) that goes to the MPU board that is notorious for intermittent game lockups and the like as this connector carries the address and data bus from the MPU board to the driver board. Oh, and there’s some more wire brush action too. Problem #6: Since we’re on the subject of the 40-pin interconnect, it looks like someone had gotten white paint all over the connector and even into the connector in some spots. I mean this is the original connector most likely, so it’s already going to have connectivity issues. We don’t need paint in there too to make matters worse. Why wasn’t the 40 pin interconnect replaced?? Problem #7: Corrosion/rust. Now this is something that’s guaranteed to make this board not work in the short term. I have no idea how this was missed or why it was ignored. Again, I would not be proud to say this was something I worked on. 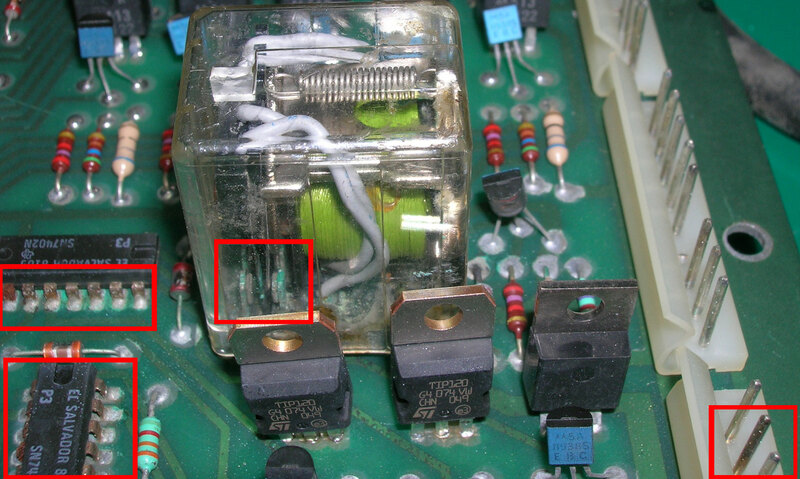 Notice how the contacts inside the relay are corroded and nearby IC pins rusted. How does that happen? Sounds like water to me… What isn’t visible is the relay’s back EMF diode that fell apart when I removed it because it was so badly corroded. Also notice the burnt connector pin in the bottom right. Problem #8: Improper part replacement. In the picture above, there are two ST TIP120 transistors. Oh cool, something that may have been done right. While this would work, the original parts are TIP122 darlington transistors. The TIP120 is a lower operating voltage version of the TIP122 (in this case, lower operating voltage could be very bad). Oddly, someone bought those TIP120’s new, and you can still get TIP122’s, so I don’t know why the TIP122 was downgraded to a TIP120. I haven’t bothered to check the circuit to see if the TIP122 really is needed vs. the TIP120, but the 50 cents to replace the two parts wasn’t worth the 5 minutes of analysis =). Alright, I think that’s all the problems with this upgraded, “gone-over-with-a-fine-toothed-comb” board for $130. Now you’re probably wondering why I didn’t return this board and demand that it be fixed properly or traded for another. The sole reason I did not do this is because the PCB quality of this particular board is excellent. I’m thinking this was a later production PCB as the copper foil isn’t lumpy with solder under the soldermask, the soldermask isn’t flaking off, and besides all the problems mentioned, this board is in really good shape. I’d hate to get a crappier board in return for this, so I decided it would be best to do all the needed repairs myself as I know I can do a much better job than the repair place can, and if this is an example of their work, I don’t want another board that they’ve touched. I haven’t taken pics yet of the completed board with every one of the problems above addressed, but it’s a night and day difference compared to what the board was. This is mostly due to the replacement of every connector on the board, and the replacement of the corroded parts.